The ruling Workers Party's candidate Dilma Rousseff has been elected Brazil's president. Rousseff, who enjoys full support of the current President Luiz Inacio Lula da Silva, gained the backing of 55.49% of voters and became the country's first female president. Silva was first elected as Brazil's president in 2002 and was re-elected in 2006. Under the Brazilian Constitution, the country's president is elected to a four-year term, with a limit of two terms. Dilma Rousseff was born on December 14, 1947, is an economist, politician and now the President of Brazil. She was appointed Chief of Staff by President Luiz Inácio Lula da Silva in June 2005, becoming the first woman to assume the position. Rousseff was Lula's designated successor and the winning candidate in the 2010 presidential election. The daughter of a Bulgarian immigrant and a schoolteacher, Rousseff was raised in an upper middle class household in Belo Horizonte. She became a socialist during her youth, and following the 1964 coup joined left-wing urban guerrilla groups that fought against the military dictatorship. Rousseff was captured and jailed between 1970 and 1972 and reportedly tortured. After her release, Rousseff rebuilt her life in Porto Alegre with Carlos Araújo, who would be her partner for 30 years. Both helped found the Democratic Labour Party (PDT) in Rio Grande do Sul state, participating in several of the party's electoral campaigns. She became the Secretary of the Treasury of Porto Alegre during the Alceu Collares administration, and later the Secretary of Energy of Rio Grande do Sul under both Collares and Olívio Dutra administrations. In 2000, after an internal dispute in the Dutra cabinet, she left PDT and joined the Workers' Party (PT). In 2002, Rousseff joined the committee responsible for the energy policy of presidential candidate Luiz Inácio Lula da Silva, who after winning the election invited her to become Minister of Energy. In 2005, a political crisis triggered by a corruption scandal led to the resignation of Chief of Staff José Dirceu. 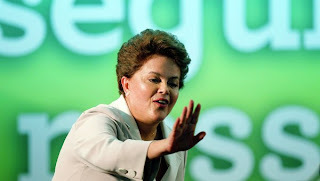 Rousseff took over the post, remaining in office until March 31, 2010, when she left in order to run for President. She was the first female elected President of Brazil in a run-off on 31 October 2010, in addition to being the first economist elected for the office.